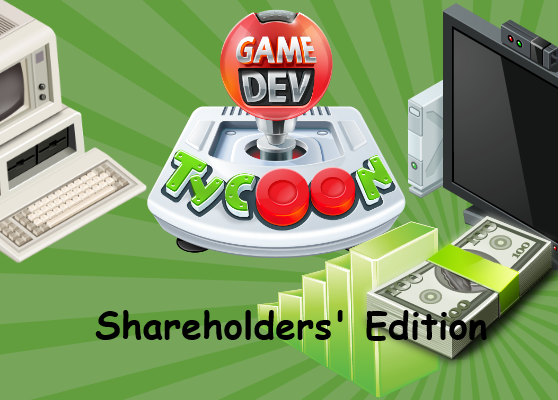 ← Vote for Game Dev Tycoon on Steam Greenlight! hahaha nice, can’t “wait” for it. Will this be an in app purchase then? seriously though, where is the rt version? Can I get the new game free if you bought the older one? But, wouldn’t this be so cool if this wasnt a April Fool’s Joke and it was real. You should add more to the game, what engine did you make this in? You gotta make this for real! We want this! Haha you guys are so cheeky with your sim tower ref. But seriously: If you ever make an Expansion or DLC, make it free for those who already bought the game. Thanks. I hate to break it to , but, you buy dlc and expansions 🙂 instead of trying to pressure green heart into giving free content, buy to support them. You should seriously make this! Awesome. This is exactly some of those things why I don’t want to play any new games anymore since a couple of years. 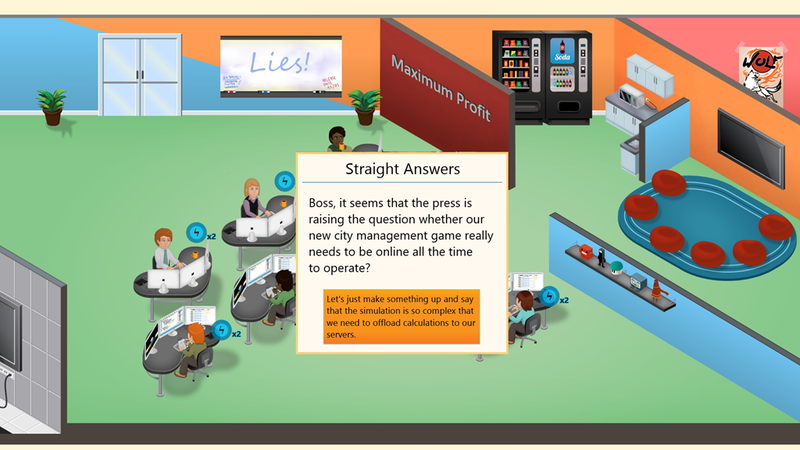 Companies find it difficult to sell games that work, and work immediately. Sometimes I still play older games such as rollercoaster tycoon and gta san andreas, which are very easy to run. Insert disk, install, play, that’s it. Compared to what you have to go trough for legal games nowadays, it sounds about as simple as pirate instructions: burn/mount, install, crack, enjoy. Instead, now you have to insert disk, type serial, install steam, register some stupid accounts, confirm and log in, download the game, have steam running and an internet connection, and then finally play! And that’s not all, because the game is initially full of bugs for which patches are released afterwards. I actually purchased grand theft auto IV and never played it because I got so sick and tired of the hassle to get it to work. After that I also purchased “Serious Sam HD the second encounter”, once again a crazy amount of stuff to do to get it to work. I played it because I was really looking forward to it so I didn’t give up, but it was the last game I ever purchased. To be honest I don’t know how your game works but the “new gaming” doesn’t appeal to me at all. I don’t want background applications, registered accounts, patches etc. I just want games that work, and work immediately. That appears to be too much to ask; no new games for me then. Oh well, good games never get old. You don’t need to be online to play. You can start steam in offline mode 😛 and I’m sure logging into steam takes less time than illegally cracking a game. Oh, and you aren’t a douche bag for pirating! Companies are having a hard time? Ooh, lets make em bankrupt! Good logic right there don’t you think? That’s why you buy on steam, not crack and worry about CD which won’t be supported in a year as they are moving toward using memory sticks. Why do you accuse me of pirating games? All of the games that I still play sometimes nowadays are games that I purchased, except GTA London because the producer released their oldest GTA games for free some time ago. This series is so awesome, the ugly truths it works in. Sorry, I don’t have a credit card, or a bank account. I just have money, in cash. I’m from Brazil. How I can buy the game? I loved it. And the price is really not expansive. A just price for my financial reality. (Sorry about my poor English. I don’t speak English). (For PayPal I nedd a Credit Card or a Bank Account). It’s a shame this is an April Fool’s joke. 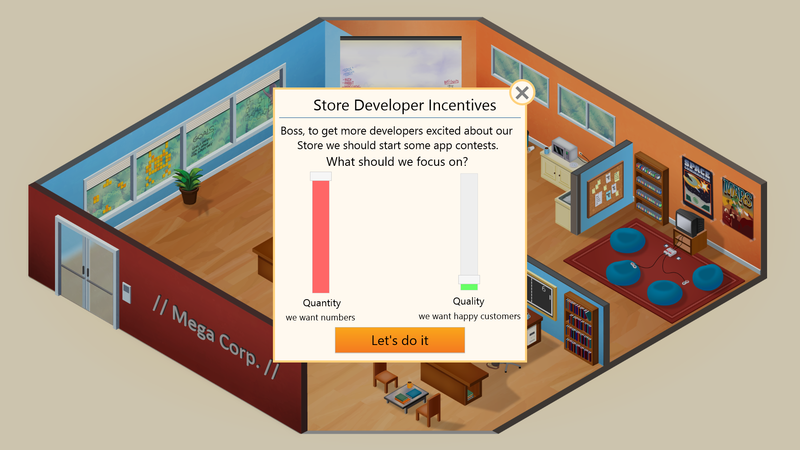 I’ve been playing Game Dev Tycoon non-stop since I bought it – and I would love to see these features! In general, my only bit of feedback would be to see more random events and opportunities to strategically choose between making more money or earning more fans. At the end of the day, I feel like that’s the philosophical battle facing almost any creative business. Give us more! We’ll pay! I bought the game, and it’s brilliant, but at very late in the game it’s get very very laggy, will you guys fix it with a future update? Also I want to try out the pirated version just for kicks. Will this be available for download on the internet aswell or just Steam? Goddamnit just realized it was an April Fools’ Joke. Interesting to try and make a joke about someone making a clone of a game with minimal changes. 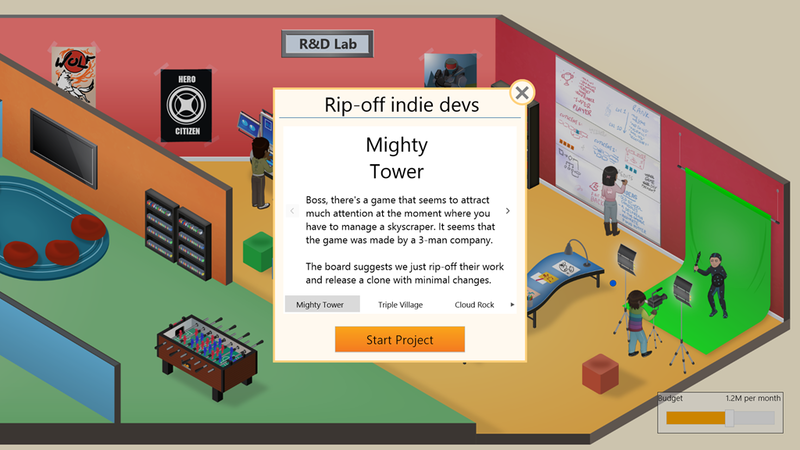 This suits the Indie company quite nicely! Will there be multi-platform games? Too bad it seems to be an April Fools’ Joke… But the additional features could have been really fun. Maybe consider it for a real release/update for the game ? Developer pirates own game, with a twist! I hope you also add more topics and genres, i need a first person shooter. also a way for us to be able to upgrade our pcs and security different relaxing places to decrease the amount of energy a person uses so they dont have to go on vacation as frequently. i know some features are available through the story but make it so we are in control of it, if we got the money we can go to a menue and buy it! also menu screen to look at previous messages, and finances for the month year day etc. away to slow down time it seems like game consuls are announced and 2 seconds later the consul is released. haha… This exp. pack is too awesome to be true… xD Anyway I’m your fan. Make another exp. pack title: Project Manager edition. XD That would be awesome too. how much will this dlc cost? Damnit I want this to be real so bad! Even though I know that this was an April Fool’s Joke. A part of me wouldn’t mind seeing something similar to this as a small DLC for maybe $1-$5.